Once you have an SSL certificate, whether you created it in WHM or purchased it, you need to add it to your domain name. 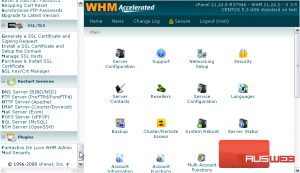 You can do that inside WHM, or in cPanel. Due to the nature of SSL-based encryption, you must have an IP address for every domain that you wish to be able to access via HTTPS. Assign a dedicated IP to your domain name now, if you want everything to work correctly. 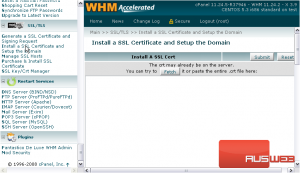 Let’s see how to install a certificate in WHM. 1) Under SSL/TLS, go to Install a SSL Certificate and Setup the Domain. 2) Here, you’ll need to enter the certificate and key, as well as the domain, IP address, and user that will be using the certificate. 3) If you created the certificate in WHM, click the Browse button. 4) Select your domain name from the list, then click Use Cert. 5) Wait for the data to be retrieved. That’s it! The certificate has been installed on the specified domain and IP address. This is the end of the tutorial. 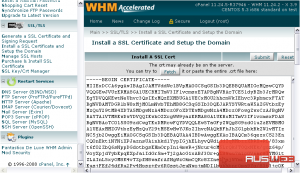 You now know how to install an SSL certificate in WHM.